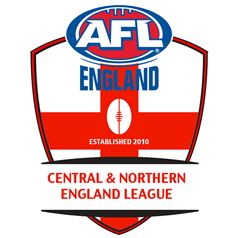 It has been a tough off-season for the Australian Football League Central & Northern England (AFLCNE). The first blow was the departure of the Newcastle-based Tyne Tees Tigers as they moved to join the AFL Scotland league SARFL for a variety of logistical reasons – the most obvious being travelling advantages. Soon afterwards, it was announced that Sheffield Thunder would not field a team for the 2018 season due primarily to low player numbers. The double-whammy losses will see the AFLCNE feature just five teams for the season. But whilst there are less teams, most of the players involved last year will be out there again for their respective clubs, so the standard of football is likely to be just as high as before – maybe higher. The season will kick off with the 2018 Haggis Cup in Scotland on 14th April. The full list of clubs involved will be advised later, but it has traditionally been a tournament that has started the pre-season for many AFLCNE clubs. Similarly, some clubs and players – men and women – will head down to London the following weekend for the AFL London Pre-Season Cup. The local action starts for the AFLCNE teams on 28th April with Round 1 to be hosted by the Huddersfield Rams as they take on the Nottingham Scorpions. In the other match, the Wolverhampton Wolverines will clash with Liverpool’s Merseyside Saints. The Manchester Mozzies have the bye and will have to wait until Round 2 to commence their title defence. The season will feature the same ten round draw as before, just with less teams each week and only one hosting venue per round required. The semi-finals and grand final will be held on the 28th July and 4th August respectively. Whilst it is true that in recent years the competition has seen the loss – either permanently or temporarily – of the Leeds Minotaurs, Birmingham Bears and now the Thunder and Tigers, there have also been signs that 2018 could be the year where the basis of the league is rebuilt for a stronger future. With some Thunder players possibly heading to the Rams until the Sheffield team returns to the playing fields, it may see a stronger Rams team to go up against the well-credentialed Wolverines and Scorpions teams. The Mozzies will again be the benchmark as they seek their fifth consecutive title. The Merseyside Saints will find things a little tougher. On face value they will lose the two teams they could most likely have defeated – the Tigers and Thunder. However, that would not be recognising their development since joining in the competition. Winning through to last season’s Plate final would have given belief that the club is growing in the right direction and the new 2018 format might further assist their development. Time will tell if the Minotaurs or Bears return to the league, but the performances of the University of Birmingham team in the past few seasons have been a good sign that the platform for a Bears’ return is being built. For the time being, it will be the Mozzies, Scorpions, Wolverines, Rams and Saints to fight out the 2018 AFLCNE season in what should be a fascinating year.